The boxer is susceptible to hip dysplasia, cancer (in older dogs), allergies and heart problems It is important that when contacting a Boxer breeder that you express health concern issues and ask the breeder what they are doing in order to help mimimize them. Please don't purchase your Boxer from a petstore which commonly are known to support Boxer puppy mills. Doing so only promotes inproper breeding ethics and promotes current Boxer health issues. 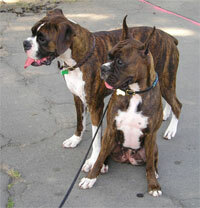 The AKC, UKC, FCI, CKC, SKC, WWKC, FIC registries recognize the Boxer breed standard. Country of Origin: Germany; thought to have evolved from early Great Danes and English Bulldogs. Has been in present form since late 1800's. . Character: This dog is happy, friendly, and intelligent. It bonds closely with the family. Temperment: Boxers get along especially well with children. They also get along well with other dogs and household pets. They are naturally inclined to protect your family from strangers. Coat: White should not cover more than a third of the dog. Coat is short and smooth. Care Coat can be kept in good condition by brushing occasionally. Comments: Can be sensitive to extremely high or low temperature, and care must be taken. Has served as police dogs, dog guides, and defenders of master's property. Very clean, no doggy odor. Warm, sleek and loving, they are marvelous children's playmates, and .